Two Naomis by Olugbemisola Rhuday-Perkovich and Audrey Vernick first caught my eye due to its cover (well done Balzer and Bray). I'm so happy that I decided to read it and that this book now exists in the world. Naomi Marie likes West African dance, board games, and being the best at whatever she attempts to do. She is an excellent big sister and adores her family. She feels lucky that she lives just blocks away from her dad and can visit him whenever she wants despite her parents' divorce. Naomi Edith likes reading, anything creative, and spending her Saturdays with dad doing the things they love. She desperately misses her mom who has moved to California since her parents' divorce. Skype just isn't the same. When Naomi M's mother and Naomi E's father begin dating more seriously, the girls are reluctantly thrown together. Both enrolled in a computer programming class at the Y, they don't see why they should have to spend so much time together because their parents like each other. Two Naomis is one of those books that gets the MG voice so well. Both Naomis come across as incredibly genuine and real. They are very different girls and despite their same names it is not at all confusing. They are so different and their voices sound so much like their characters, that it is never difficult to tell them apart. Naomi M is a force of nature. She is outgoing and a little controlling. She likes to be in charge and often is due to her role as older sister. She cares deeply about her family and friends and puts a high value on loyalty and hard work. Naomi E is less sure of herself. She is more apathetic and takes the easier route in things when she can. She is really struggling with missing her mom and feeling left behind. Different as they are, they are both sympathetic relatable characters that realistically project the MG mindset. Both are a little self consumed and oblivious to things not directly involving them. The cast of secondary characters is well done too. Both Naomis best friends are wonderful. They too are very different from each other AND very different from both Naomis. They are supportive of their friends but also their voices of reason (or at least they try to be). Naomi M's little sister Brianna is all four year old. No filter, too much energy, and a full steam ahead outlook on the world. The parents are all well done too. They make mistakes and behave selfishly at some points, but they are active involved parents who are doing their best. I really like how they talk to the kids and work hard to make the best out of the situations they are in (some of which came from their own mistakes). The plot of the book centers around the class the two Naomis take together and the project they are partners on, but the crux of the book is about relationships. I really appreciate that this is a book that shows the hard adjustments and compromises that come with one of your parents dating someone else seriously after a divorce. We have a lot of MG books that deal with the process of divorce, right after a divorce, or right after a remarriage, but I can't think of another one that deals with this aspect of the process. Both girls have to sort through a lot of complicated feelings while also learning to work together and compromise. It's just incredibly well done all the way around. I highly recommend this for all lovers of MG realistic fiction. It is a fun, quick read with excellent characters and wonderful themes. It is definitely a book I'm adding to my list of favorite sibling stories. I read an ARC made available by the publisher, Balzer and Bray, via Edelweiss. 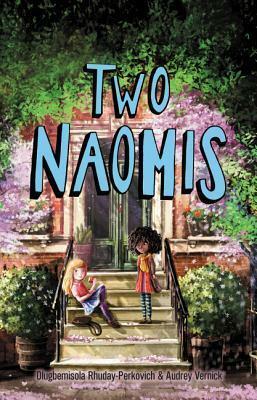 Two Naomis is on sale September 13th.